Both these Hebrew theories may seem far-fetched to most readers. The above statements are introductory teasers. The articles in the series will not only explain but substantiate such claims. As one reads through all the articles, you will understand why the GOT Project proposes these two customs as the best solutions for understanding the tongues of Corinth. In both instances, the reader will be shown how the church adapted these Jewish customs in the Greek, and later, Latin context. The discussion does not stop with a Jewish explanation. The context is about Jewish liturgy in a Greek-dominated city. The research will also note the tensions created by the Greek culture, life, and language that surrounded them. This influence also has a great contribution to the Corinthian tongues saga. Praying in tongues is another part of the liturgy that will be analyzed in a separate article. The use of Hebrew in the ancient Jewish liturgy outside of Israel is the most important aspect of this claim. If the Hebrew connection could not be supported, then this solution would be invalid. However, there are substantial evidences that prove such a theory, but since this is new to most readers, I will write at great lengths, and provide important details. The first letter to the Corinthians is old – written in the first century. The letter was addressed to the earliest gathering in Corinth that was a combined assembly of Messianic Jews and Greek converts. As with any new fledgling organization, they were struggling with what Jewish customs were to continue and which ones were to be left behind. What Greek modes of practice were to be included, and which ones to be excluded. This is an updated series from what was posted almost a decade ago. The four dominant themes about Corinthian tongues over the last five-hundred years. A historical Catholic view. Early Catholic writers and leaders do not literally address Paul’s statements on tongues. There only a few exceptions: Epiphanius, the Ambrosiaster text, and a tad owing to John Chrysostom. This result is largely because earlier church writers emphasized allegorical and/or personal obedience rather than a critical interpretation of the Bible. For example, Augustine, Bishop of Hippo, often cited I Corinthians 13:1, “If I speak in the tongues of men or of angels, but do not have love,” to encourage his followers. He never did explain the context that propelled Paul to write such an exhortation. Origen wrote a commentary on I Corinthians and offered a few tidbits. However, they are not definitive enough. He spent most of his energy in I Corinthians to reinforce his idea of the role of knowledge in the Christian life. Another reason regards the priority of early church writers. The problem of the I Corinthian tongues passages lacked any passion or concern to solve during their time. There were more pressing issues. The Cessationist view of Corinthians. This interpretation believed that any miracle, including that of speaking in tongues, died with the early church and could never be repeated. Therefore, any research on the Corinthian tongues problem is only for historical purposes. The tongues of Corinth have no impact on the modern Christian life. The Higher-Criticism explanation. Higher-Criticism is the dominant modern theory of explaining the tongues of Corinth and Pentecost. This doctrine believes that the christian rite of tongues has its origins with the Greek prophetesses at Delphi. These women performed inside a temple that had fissures underneath issuing volcanic fumes. The inhalation of the fumes would put the prophetess in an ecstatic state and would prophesy in what was believed to be unintelligible utterances. Ecstasy, glossolalia, and ecstatic utterance are keywords for this interpretational system. The Higher-Criticists supposed the earliest Christians synthesized this ancient Greek rite as part of making Christianity a universal religion. Church writings and ecclesiastical history are willfully excluded from this premise. For more information on higher-criticism and tongues see the series starting with: Introduction to the History of Glossolalia for more information. Pentecostals, Charismatics, and Third-Wavers. Most of the leaders in these movements rely on other tongues found in I Corinthians and one instance in the Book of Acts to substantiate their tongues doctrine. Some call it a private prayer language, while others name it glossolalic prayers. In fact, other as in other tongues does not exist in the original Greek of I Corinthians. The adjective other was added to I Corinthians by European protestant translators as a polemic against the Catholic Church. The protestant translators never intended this idiom as a strange or mystical experience. The reader should not be thrown off by the use of the noun tongues in Paul’s I Corinthians English text either. English Bible tradition set the translation as tongues which is old and dated. The noun languages should be used instead. None of the above theories provide a complete or adequate framework to explain Paul’s reference to speaking and interpreting in I Corinthians. The context of such an approach along with the wealth of information has necessitated breaking this into a series of articles. The whole series is found at the Tongues of Corinth section of the Gift of Tongues Project. Building a portrait of speaking in tongues from a first-century liturgical perspective is fraught with difficulties. The greatest obstacle is lack of primary material from this period. More substantive information can be gleaned from fourth-century ones. Mr. Graves is right. Although there are a few literary pieces to draw from around the first-century, and some even earlier, the most substantive information comes from the fourth-century. It is necessary to both reconstruct and also deconstruct from there. One must be ever aware that the syngagogue liturgies have evolved over that 300 year period. The fourth-century or so Rabbinic leaders and writers may have revised their own liturgy history to fit their own contemporary narrative too. Whatever conclusion any researcher portrays on this topic is a calculated and thought-out opinion. No conclusion, including my own, can be considered final because of the lack of primary data. There is considerable debate about the role, function and even existence of the synagogue in first-century Judaism. 2 This series of articles assumes that the synagogue had already an established existence in both Israel and the diaspora during the first-century. This supposition is clearly indicated by the references found in the New Testament texts. The liturgy practice of speaking and interpreting in the synagogue and how it was performed in Corinth are the features looked at here. The city of Corinth is geographically located in a critical position. It is situated on a narrow finger of land called an isthmus which connects the southern tip of Greece with its mainland. In historic times, Corinth was caught between two rival cities; Sparta in the South, and Athens, slightly to the north-east. The Corinthian residents greatly suffered by choosing the wrong sides during many conflicts. Corinth was sacked and left desolate in 146 BC by the Roman consul Lucius Mummius3 in 146 B.C and left that way until 44 BC where it was purposely repopulated by the Romans. The Greek language in the first century was an international language of commerce and communication throughout the Roman and Parthian empires (from the border of Afghanistan to the western reaches of the Mediteranean basin). It was very similar to how English is used today throughout the world. However, just as in the application of the English language, it was applied unevenly, and there were tensions within ethnic groups about its transformative influence on their languages and cultures. In order to explain Paul’s reference to tongues from a Jewish background, it is necessary to briefly dwell on the character of Paul himself. It is described in Acts chapters 21 and 22 Paul discussing a matter with a Roman commander in Greek, and then speaking to the public in in the language of the Hebrews–probably meaning the Hebrew language since this incident happened in Jerusalem (If this incident occurred in the Galilee or other northern reaches of Israel, it would have been Aramaic or Greek). Paul may have known Latin, but this has not been validated by any principal source. Paul saw the tension between Jewish and Greek identities as a major obstacle to his vision of an expansionist form of Judaism. On two occasions he wrote a reference to this. The first one, in his letter to the Romans16 stating there is no distinction between a Jew or a Greek–Ἕλλην Hellen. Paul was referring to a person of Greek origin who was not Jewish in this instance, not a Hellenized-Jew. There was a tension that a true Jew cannot be Greek or vice versa that will be described in detail in this series. This problem may also have crossed into the Aramaic language and culture–the identity of a true Jew was the ability to speak Aramaic, but information about this is missing. Even with this brief explanation shown above, his writing style, life and practice were steeped in Jewish influences. The founding of any community with his personal involvement would reflect this. The reader must keep these things in mind as the series progresses in its explanation of the tongues of Corinth. The initial Corinthian assembly was a mixture of Jews and Greeks. There is not a single reference to Christianity because Christianity did not exist yet. This Corinthian assembly was under the Jewish umbrella. It would take well over a century before the Jewish Messianic movement would become entirely distinct from its origins and be solely called Christianity. Jerusalem, and later, Yavneh (the city where the Jewish leadership were forced to move to after the destruction of Jerusalem), would no longer be the centre of its existence. In fact, it was in Yavneh, sometime between 80 and 110 AD, where the critical decision was made that you could not be Jewish and believe in Jesus.18 This was where the complete severance between the two groups occurred. The structure of Corinth was clearly Jewish, but the attendance was of mixed ethnicity. The mentioning of a converted synagogue leader, who must have exercised some internal authority in the development of the Corinthian Church, would have had a serious influence on the liturgy. Paul’s address on the tongues of Corinth are reminiscent of Jewish tradition. 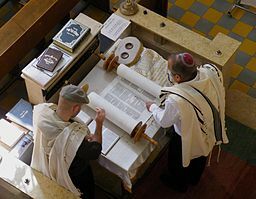 Speaking, interpretation, the office of an interpreter, and the Amen are all found in Jewish liturgical traditions. Discovering and applying the Jewish modes of worship and liturgy are the best solutions for explaining the tongues of Corinth. You can find the logic and substantiation behind this in the articles mentioned above. see Adolf Harnack’s, The Mission And Expansion Of Christianity in the first three centuries Vol. 1. Pg. 8 for more details. Sotah 49a Based on a text attributed to Simeon ben Gamaliel. Simeon ben Gamaliel was likely reflecting on a tradition of learning Greek established by his father, Gamaliel I.